After she lost her job in the financial crisis, Svetlana Kubitskaya opened her own candy company and made it a success with the help of her LiveJournal blog. A fashionably-dressed Russian blonde strode into a Barcelona candy shop and found herself in the Middle Ages. “It was like an alchemist's laboratory: dim light, Gothic decoration, glass flasks with multicolored liquids,” recalls Svetlana Kubitskaya, a 33-year-old Muscovite, who in 2009 set off for Spain to learn how to create and sell personalized hard candies with customers' names, congratulations, and kind wishes visible through transparent exteriors. After half an hour of watching water, sugar, and coloring transform into hard candies, she promised Papabubble's owner, Alejandro Sinyavskii, a native Spaniard with a Slavic surname, that she would consider professional collaboration with him. “The subtleties [of making the candy] are of little concern to me, really. Deep down, the decision to start a business and immediately put a good deal of money into it had already been growing inside me,” says Kubitskaya. Kubitskaya had originally wanted to open her own business after she lost her job in the 2008 crisis. Her husband, an upper-level manager of a major holding company, was not upset by the fact that a member of his family had suddenly become unemployed; moreover, Kubitskaya's parents had left her “a certain amount of money,” which she wanted to invest in the new enterprise-to-be. 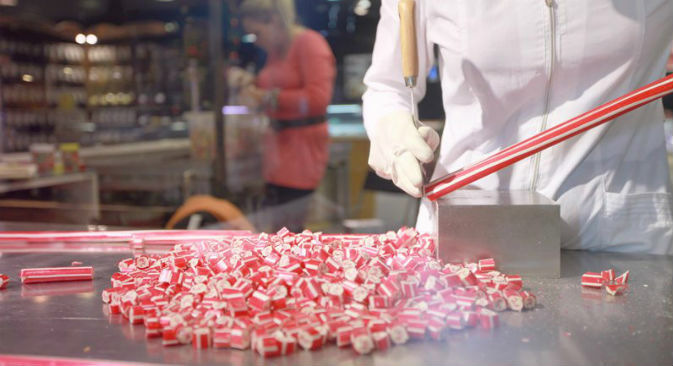 After a trip to the Pyrenees, Kubitskaya's friends told her about Papabubble, where hard candy with inscriptions was made from scratch right in front of visitors. She immediately bought a ticket to Barcelona. For €60,000 ($78,947) – the cost of the franchise – Alejandro Sinyavskii undertook to provide Kubitskaya with a business plan, train two employees in Barcelona, monitor the opening of a store in Moscow with his franchise's name and help fine-tune the business processes. The store opened in October of 2010. Things did not go according to plan, however. According to Kubitskaya's calculations, about half of the 10 million rubles ($305,000) invested in opening the store turned into the cost of her own inexperience and mistakes, as well as her Spanish counterparts' perfectionism. “From the very beginning, our store was in the red and certainly was not bringing in a daily $1,000-revenue,” Kubitskaya says. Having witnessed this, Sinyavskii stayed in Moscow for a week or two to watch things unfold and to give Kubitskaya a few marketing tips. The first tip was to hang a bell in front of the store and ring it three times per day, drawing the attention of everyone nearby to the open preparation of a fresh batch of sweets. “Of course I can understand that ringing a bell in the center of Barcelona can draw in tourists, onlookers, and passers-by. [But] on the third floor of a shopping mall in Moscow, that would be absolutely useless,” the businesswoman observes. The second tip for luring customers was to place a colorful bowl of brightly colored candies by the store's entrance. Anyone passing by would have to try one and delight in its taste and originality, head into the store, and buy a jar for themselves, plus another as a gift. The store “devoured” $20,000 every month; $10,000 went to rent and utilities, while another $10,000 were spent on employee wages and the purchase of ingredients and packaging. Kubitskaya's situation was turned around by her online popularity, which she had earned long before opening the store. The blog she had started in 2007, which offered unreserved and often quite sharp and provocative posts on “women's” subjects (family, relationships, travel, cooking), secured her a loyal audience. On May 13, 2013, her Russian-language LiveJournal blog was ranked 143rd overall in user ratings and was the 219th most viewed. So when Kubitskaya began turning her “sweet” dreams into reality, her online audience found out immediately. She maintains that she has yet to resort to promoting her products through direct advertising; rather, her blog was just what she needed to find a new niche. A few years ago, the RUSNANO corporation moved to a new office, and its corporate management ordered a party with promotional merchandise to mark the event. “We had already tried everything: pens, flash drives, notepads, chocolates – we seemed to have come full circle,” says former public relations employee, Anna Mironenko. “But then, while browsing the web, I found out about Svetlana's candies through her LiveJournal.” As office-warming gifts, RUSNANO's executive management received a 10-kilogram hard-candy key, and each employee received a smaller one, while clients and partners helped themselves to little candies with “RUSNANO” written inside while waiting for meetings. Kubitskaya's business has since advanced into a new stage. Corporate sales turned out to be far more interesting than retail. She had to close her store in the mall. “Half of my husband's salary went into my employees' wages,” she says. But within several months, she picked up such clients as rabota.ru, Yota, UPS, the radio station “Russian Radio” and the Russian TV channel “Center.” And then Kubitskaya's retail outlet reopened – this time in the Moscow-area settlement of Barvikha and without a sign for the Spanish Papabubble. She now does business with her own brand name, “Slad iS.” The businesswoman flatly refused to say how she was able to rent 25 square meters in Barvikha Luxury village and under what conditions. She merely says that she did so “through friends of friends,” and much less expensively than in the “Capitol” mall in Moscow where her Papabubble store once was. In March 2013, Kubitskaya and a Ukrainian partner opened Slad iS in Kiev, having invested 2.5 million rubles (about $76,000) therein. In Ukraine, entrepreneurs from Greece and England have already opened similar projects, though they, like the Spaniards, are placing their bets on retail; they expect that people will pass by their stores, see how the candy is made from scratch, and buy it. To the Muscovite developing her corporate sales in both Kiev and Moscow, competition is nothing to fear. She smiles, “I have already gone through all that."